Russia: discovered a stone with a microchip, in a layer that is believed to be 250 million years by government academia. In fact a few days ago, some Russian scientists, the Rostov region, became the protagonists of an incredible discovery: a stone with a microchip 250 million years old (some even speak of 450 million years). However thses dates are called into question without checking the c-14 content in the stone. According to government educators this stone would indicate that 250 million years ago an unknown civilization populated our Earth; a discovery-fetched and fantastic. Labinsk area in the Krasnodar region, where the encounter of stone. This stone was discovered by Victor Morozov, a local fisherman in the Russian city of Labinsk in the Krasnodar region. Experts have confirmed the presence of a microchip inside unknown, reporting that absolutely can not be associated with the inventions of mankind. 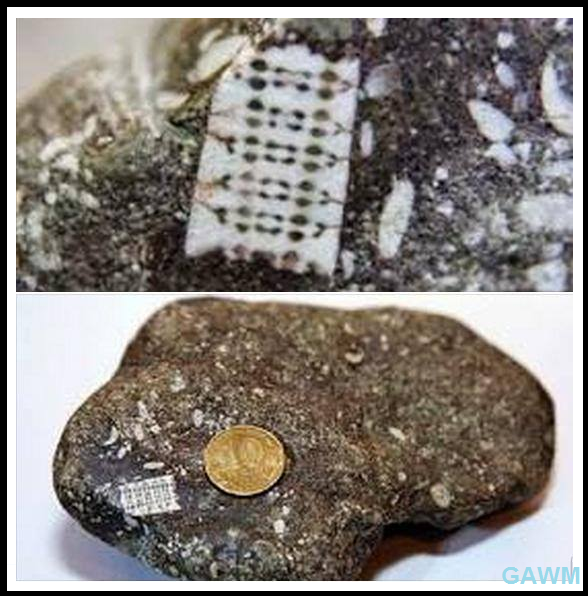 Also on the surface of the stone was found a fragment of a technology previously unknown to science. This shocking discovery confirms the theory that, already at that time, an advanced civilization lived on Earth. We are talking about a people so advanced and capable of developing high technology. Researchers have announced that in the near future will be revealed more details about the existence of this civilization.